LAHORE: Celebrated actors Aisha Khan and Faizanul Haque were present at the X2 Café on MM Alam Road on Tuesday, for Physiogel's Skin Heaven Bloggers' Meet that was seen as both, a culmination of a previously held Physiogel's 14-day blogger challenge as well as an interactive way to get to know Physiogel's consumers and their opinion after trying and testing Physiogel's recently launched ranges; namely Physiogel Daily Defence Facial Care Range and Physiogel Calming Relief Range. "It is very important for a brand like Physiogel to have passionate and effective story-tellers as its brand endorsers! 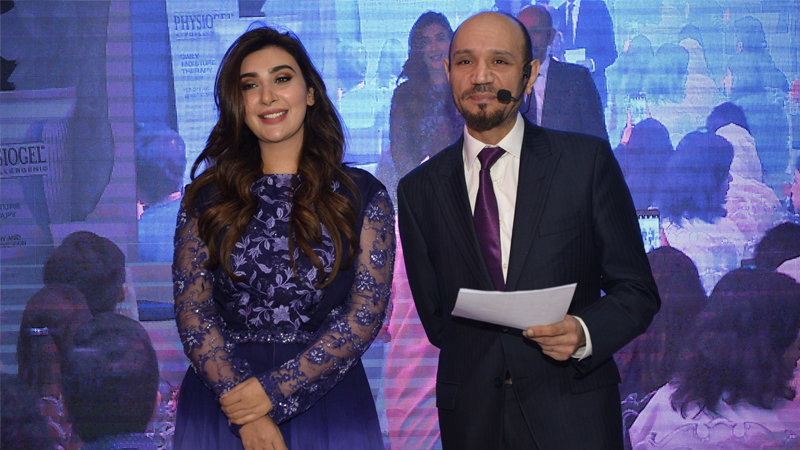 We are always looking for fresh and innovative ways to engage our consumers and I am truly delighted to launch our latest collaboration between Physiogel and its key influencers," said Ayeza Sumsam Mohiuddin, Glaxo Smith Kline Consumer Healthcare's (GSKCH) brand manager for Skin Health Category, who opened the event with a welcome speech and gave a brief brand introduction to the audience. Aisha Khan, the official brand ambassador for Physiogel and Faizanul Haque, the host of the event were on hand to discuss the benefits and the efficacy of the complete skin care range that Physiogel has to offer to its consumers. Their encouraging demeanour combined with a customised heaven-like ambiance of the place made the entire event enjoyable for the attending bloggers and socialites. The audience was then pampered through a comforting mini-spa, a skin bar as well as a live moisture test; demonstrating Physiogel's efficacy as a scientifically proven moisturizer for daily skincare regime. GSKCH Chief Executive Officer Sohail Ahmed Matin said, "Physiogel is a skincare brand which is not only clinically proven and backed by its patented bio-mimic technology but it is a brand that has the power to remarkably improve people's lives and enable them to do more, feel better and live longer," Matin also said that in today's era, influencer marketing is the newest trend and he is very excited to see a successful partnership between Physiogel and its key brand endorsers. GSKCH Marketing Director Sadia Nasiruddin said, "In today's age, bloggers play a key role in helping consumers to make more informed decisions regarding the brands they want to interact with. It gives me great pleasure to see that a skincare brand like Physiogel is actively reaching out to its consumers via leveraging the power of influencer marketing! It is a beginning of a great journey ahead!" The night came to an end with a scrumptious dinner, after which the bloggers continued towards the skin bar where the attendees had the chance to personally experience the usage and effectiveness of Physiogel's newly launched ranges.